When you have 5 exceptional Hockey Mom of the Month winners, how do you decide who will be Hockey Mom of the Year? It was the task that we gave our judging panel which was joined by special guest judge and fellow hockey mom, Leslie Rutherford, of the Pittsburgh Penguins. 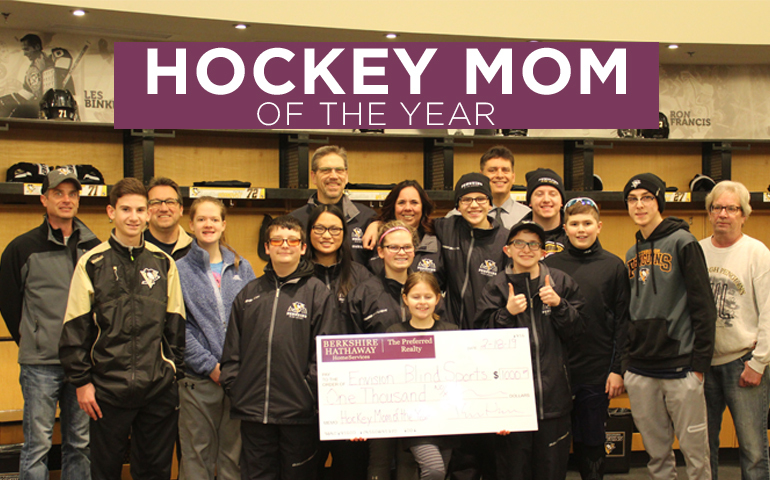 It was a hard decision for our panel, but they felt that one mom truly exemplified all of the characteristics of a winning Hockey Mom of the Year. That mom is Tammy Kitterman with the Pittsburgh Penguins Blind Hockey Team. On the team, Tammy’s title Team Coordinator and Parent Liaison, but those titles don’t adequately cover all that Tammy does for the Pittsburgh Penguins Blind Hockey Team. She assists the head coach, who also is her husband Grant, provides communication and information to all the parents, and searches out local rinks to find those willing to provide ice time for this small group of players so that they can practice. But above all of her other duties, Tammy is a source of support for the kids both on and off the ice. With only nine other blind hockey teams across the U.S. and the Pittsburgh Penguins Blind Hockey Team being the only blind hockey team in the area, the players travel on a consistent basis for weekend tournaments and practices. When a family cannot travel with their athlete, Kitterman becomes a second mom so that every child can participate. She takes the players under her wing and treats them as she would her own son, Brock, a star player on the team. Knowing the importance that the players feel and get the absolute most out of being part of a team, Kitterman coordinates team outings in the host cities of tournaments. Recently when the team was traveling to Washington, DC, Tammy set up a sightseeing tour for the kids to see the White House and the monuments. Tammy described in detail the lay of the land and made sure that the children who also have hearing impairments could hear the descriptions so they were not missing any of the details. During the games, Tammy is one of the biggest cheerleaders routing each player on, and she also organizes numerous luncheons and dinners to make sure each player gets the absolute most out of being part of a team. Off the ice, Tammy has the same dedication. In the daytime, Tammy is a school bus driver for Peters Township School District. In between runs, Tammy acts as a Parent Advocate and Liaison for parents and children who may need guidance in receiving specialized services from different school districts in the area. When school is not in session, Tammy does not take summers off. For the past 10 years, Tammy has been a “Camp Mom” at Slippery Rock University’s, “ENVISION Blind Sports Summer Camp”, which takes place every year during the second week of June. We are honored to have Tammy Kitterman as our Hockey Mom of the Year, and thank her for all that she does for youth hockey and her community at large. Congratulations!